How To Make A Nourish Bowl! 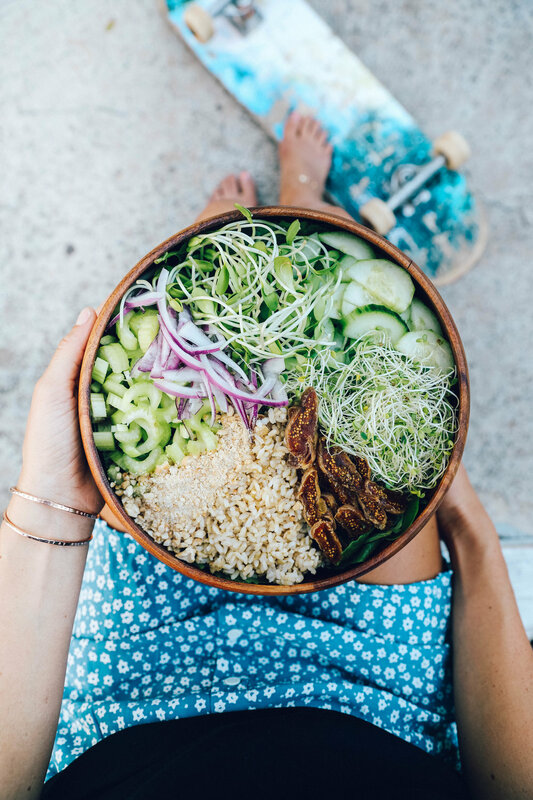 Nourish Bowls are a trend worth diving into! Not only are they delicious they are a sure way to get in a variety of nutrients! I love making bowls personally because they are healthy, satisfying, easy to make, even easier to clean up and its a great way to make left overs special! If you have never made a nourish bowl yourself heres a few simple steps to get you started! SANTA FE BOWL-YOU CAN USE THE DRESSING RECIPES FOR ALL SORTS OF THINGS! PICK A THEME! This makes it much easier if you have a bit of a theme in mind such as a taco bowl, mediterranean bowl, santa fe bowl, curry bowl, sushi bowl, roasted root bowl, Hawaiian hay stack bowl, sampler bowl etc! They can be as simple or as complex as you'd like! There is no wrong way, unless you’re eating off a plate… then you’re totally left field ;) just kidding! LEMON GARLIC CAULIFLOWER RICE BOWL- SIMPLY MINCE CAULIFLOWER UNTIL IT LOOKS LIKE RICE (YOU CAN DO THIS IN YOUR BLENDER OR FOOD PROCESSOR) THEN (OPTIONAL) -SAUTE WITH A LITTLE OLIVE OIL, GARLIC, ONION, SALT AND PEPPER FOR A COUPLE OF MINUTES AND THROW IN SOME FRESH PARSLEY AND A SQUEEZE OF LEMON! THIS IS A GREAT GRAIN FREE OPTION! LEFT OVER BOWLS-NEED A WAY TO USE UP YOUR LEFT OVERS? PUT EVERYTHING OUT AND LET PEOPLE MAKE THEIR OWN BOWL! BUILD YOUR OWN NOURISH BOWL MEALS ARE THE BEST AND A GOOD WAY TO FEED A CROWD! Step 4: CHOOSE VEGETABLES:FRESH, ROASTED, SPIRALED, STEAMED, CHOPPED-HOW EVER AND WITH WHATEVER YOU HAVE ON HAND OR IN THE MOOD FOR. Step 5: CHOOSE A HEALTHY FAT: NUTS, SEEDS, AVOCADO, VEGAN CHEESE ETC. Step 7: CHOOSE HERBS AND CITRUS: A SQUEEZE OF LEMON AND A FEW FRESH HERBS IS SURE TO BRING YOUR BOWL TO THE NEXT LEVEL! Step 8: ASSEMBLE: If I am in a hurry I will just toss it all in a bowl or serve everything separately and let people build their bowl bowls! If you want to make a “proper nourish bowl” start with your base- your greens, add your main starch or root vegetable, and then in sections place the rest of the ingredients in a pie shape and drizzle with your choice of flavoring! I always LOVE seeing what you make and I LOVE that we can all get ideas from each other and stay inspired while keeping things interesting! Im so happy we did our #myearthybowl challenge together! I hope that you gained some new ideas for meals! If you want to get inspired check out the hashtag #myearthybowl on Instagram to see what others are creating! Anyway, I hope you love these recipes! I have so more Id love to share with you in the near future! ANTI-PASTA BOWL WITH MACADAMIA PESTO RECIPES-ADD ROASTED VEGETABLES OR YOUR FAVORITE GRAIN TO SPRUCE IT UP EVEN MORE! THIS PESTO WORKS GREAT LIKE ANY PESTO-SALADS, PASTA, ON TOAST ETC.